Quakertown, PA - Standing in front of his campaign tour bus, Mitt Romney on Saturday told religious conservatives he would do “the opposite” of what President Barack Obama has done on Israel. Romney spent most of the day appealing to voters in Pennsylvania, a battleground state he said he would win in the fall, although Democrats succeeded in pushing his bus tour through the state off of its original itinerary. “I am going to win Pennsylvania,” Romney told a cheering crowd in Cornwall, a small town in the center of the state, as his campaign bus rolled through on the second day of a five-day, six-state tour. Romney took some time out of his tour to address religious conservatives at the Faith and Freedom Coalition in Washington via video uplink, telling the crowd he believes the president is more concerned about Israel attacking Iran than he is about Iran obtaining a nuclear weapon. His hawkish speech was the first time he’s discussed policy toward Israel at length since becoming the likely Republican presidential nominee. “I think, by and large, you can just look at the things the president has done and do the opposite,” Romney said when asked about Israel. He spoke to the gathering of religious conservatives from Weatherly, Pa., via video uplink with his campaign bus in the background. Democrats accused Romney of distorting Obama’s record on Israel. Spokesman Ben LaBolt said Obama has given Israel more security assistance than any other administration and has stood with Israel at the United Nations. After his address, Romney’s bus continued on to Quakertown, where Democratic protests forced him to take a detour. Romney rerouted his tour after former Pennsylvania Gov. Ed Rendell and several other Democratic officials held a press conference outside the Wawa gas station where the former Massachusetts governor had planned an early afternoon stop. Protestors gathered outside the store. So Romney decided to visit a different Wawa store instead. Instead of making prepared remarks to the crowd gathered outside the first location - Romney’s advance team had set up a microphone - the Republican’s bus went instead to the second Quakertown Wawa and made a quick tour through the store. The detour threw Romney off the jobs-and-economy message he had been pushing earlier in the day. “I think we have to have a very careful review of who’s giving a fair shot to the American people,” Romney told a crowd of several hundred packed into a warehouse at Weatherly Casting and Machine Co., next to the train tracks that run through Weatherly, Pa., about 90 miles northwest of Philadelphia. That stop was the first of three appearances in small towns in this state with 20 electoral votes that Obama won in 2008 with 54 percent. No Republican presidential nominee has carried the state since 1988. The tour is intended to challenge Obama in states where he’s strong. 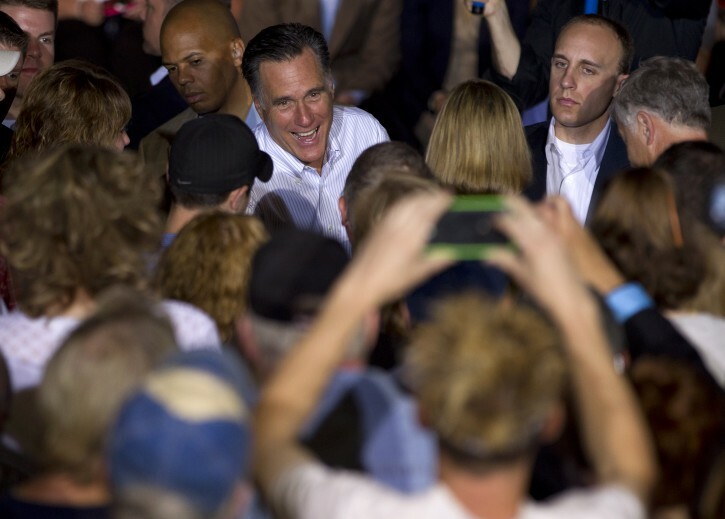 Romney is targeting smaller cities and towns through the state’s more conservative midsection. Weatherly is in Carbon County, which Obama narrowly carried in 2008. Romney also stopped Quakertown, in Bucks County, as well as at Cornwall Iron Furnace, a national historic landmark. That’s in Lebanon County, which GOP nominee John McCain won in 2008. Romney also took time to do an interview for CBS News’ “Face the Nation” program. Sunday will mark the first time he has appeared on a weekend political talk show since becoming the presumptive Republican nominee. Romney told host Bob Schieffer that the president’s decision to allow some young illegal immigrants to stay in the country instead of deporting them was a largely political move. “If (Obama) really wanted to make a solution that dealt with these kids or illegal immigration in America, than this is something he would have taken up in his first three and a half years, not in his last few months,” Romney said. Romney is on a bus tour, but he planned to fly each night to the next state and ride from town to town during the day. It’s his first traditional campaign swing since the primary and is aimed at undecided voters in six pivotal states won by Obama four years ago: New Hampshire, Pennsylvania, Ohio, Wisconsin, Michigan and Iowa. The tour represents a new mode for Romney in the general election. During the primary, Romney sometimes ran into trouble in less-scripted environments, and the bus tour probably will test him again. He also has long faced questions about his ability to connect with average people. His efforts to connect were clearly on display Saturday, when he was careful to learn the Pennsylvania word for submarine sandwiches - hoagies - and noted the intra-state rivalry between Wawa, which is popular in eastern Pennsylvania, and Sheetz, another convenience store that’s the favorite in the western part of the state. Unfortunately, Romney chose the town closest to the state’s geographic center - Cornwall is near Harrisburg - and the crowd was split. “Well, I went to a place today called Wawa’s, you ever been to Wawa’s, anyone’s ever been?” he continued. Romney sounds sincere and like a true friend of Israel when he says that Obama is more concerned about Israel taking military action. somebody who is not a friend of Israel (like so many of our previous Presidents) always attempts to stifle its attempts to defend itself to some capacity. Here Romney is talking about Israel going all out to prevent a doomsday scenario for itself and possibley the world. I see him as a truer friend of Israel than George W. Bush, who I think only supported Israel to appease his Christian Evangelical base. He is not hte leader of the mormon church so I don't think he has that power , mister. In addition, baptism and foreign policy towards Israel are not the same. are you worried that it actually means something? From many comments here, it seems like Romney runs for prime minister of Israel. Romney is basically asking for us to be his favorite cream pie. No thanks. Romney says he'll do the "opposte" of Obama on Israel. Let's see -- Obama has increased the level of military and intelligence aid and cooperation between the U.S. and Israel. Wil Romney do the opposite? Obama stood by Israel during the Gaza flotilla fiasco. Will Romney will do the opposite? Obama stood against the whole world and told the United Nations "no Palestinian state without a negotiated settlement." Will Romney do the opposte? Obama immediately responded to a plea from Netanyahu and made sure no Israelis were harmed when they were held hostage in Egypt. Will Romney do the opposite? Unlike such gevaldig friends of Israel like Reagan, Obama has never held back military aid to Israel (or even just threatened to do so) over disagreements on policy. Will Romney do the opposite? I wonder what all the these fine "conservative" Yidden would have done without Obama's instructions to veto a Palestine State in the U.N.???. you are correct. Excellent post! I cannot believe people are falling for Mitt Romney's "foreign policy on Israel": um, basically to just do the opposite of whatever Barack Obama does. Well ok! That really spells everything out for us all! (lol) Especially for those of us who are war-weary & unsure of how fool-hearty & cowboy-like, Mitt Romney intends to be around the world, with OUR military! I don't know about the rest of you... but I'm not interested in another cowboy-wannabe, talking tough & ruining lives everywhere! Not to mention... I see a comment on here, where someone has said that our President has "spit in the face of Israel". Really?!?! No, I believe he spit in the face of EVERY SINGLE Palestinian, when he refused them their Statehood request at the UN! What is wrong w\people?! How quickly they forget! And how UNGRATEFUL some of them can be! Every American President has been a pretty decent friend to Israel since it's conception - and Barack Obama has been NO exception to this. AND, yes... his actions prove that. “ Excellent post! I cannot believe people are falling for Mitt Romney's "foreign policy on Israel": um, basically to just do the opposite of whatever Barack Obama does. "So the rhetoric of him "hating Israel" & wanting to see the "destruction of the Jews", doesn't exactly hold up, against EVIDENCE against the contrary! (lol)"
Sherry, these are the 'dog whistles' for you know what! That maniac Gingrich during the primaries, referred to the President as a 'Food Stamp President,' and a follower of Saul Alinsky, who tried to improve conditions in Chicago's African American ghettos in the 50's. When you read idiotic posts that accuse the President of being a tyrant, a despot, a socialist, a Marxist, a Mau Mau sympathizer, an anti colonial, a Muslim sympathizer, and not U.S. born, what you're reading are those dog whistles from those too cowardly to use the N word! B. Hussein Obama's address to AIPAC this year was described by Iran's government in positive terms. (!!!!!) Think about that: the horrific, antisemitic, terrorist, anti-American Iranian regime (horrific to normal people, that is, as opposed to naturei karta lunatics) actually APPROVED OF what the Failure-in-Chief, B. Hussein Obama, said. That ought to make ANY normal American vomit. Romney will do the opposite: his speeches will be condemned by nations such as Iran, Venezuela and other enemies of the USA. “ "So the rhetoric of him "hating Israel" & wanting to see the "destruction of the Jews", doesn't exactly hold up, against EVIDENCE against the contrary! (lol)"
Romney is going to do an "opposite" on humanity. “ B. Hussein Obama's address to AIPAC this year was described by Iran's government in positive terms. (!!!!!) Think about that: the horrific, antisemitic, terrorist, anti-American Iranian regime (horrific to normal people, that is, as opposed to naturei karta lunatics) actually APPROVED OF what the Failure-in-Chief, B. Hussein Obama, said. That ought to make ANY normal American vomit. Post 15 is the perfect example of the ignorant and deceitful garbage spewed by the unhinged Obama haters in the frum community. I'd like you to give one example of what the Iranians supposedly liked in Obama's speech to AIPAC. Iran did not praise the speech, and you know it. I have the transcript, It's easily found on Google. Did the Iranians praise the part where he spoke of the "extraordinary legacy of more than six decades of friendship between the U.S. and Israel"? Did they praise the part where he said "Israel is the historic homeland of the Jewish people"? Did they praise the part where he said "Israel's security is sacrosanct and non-negotiable"? Did they praise the part where he said "We will do whatever it takes to preserve Israel's qualitative military edge because Israel must always have the ability to defend itself"? Did the Iranians like the part where he said that "A nuclear-armed Iran is completely counter to Israel's security interests, but it is also counter to the national security interests of the United States"? Sir, as you can see from the few examples (of many) I have provided, you are either a liar or an ignoramus of the worst kind. Thank you. It is always an extremely rare privilege in these days of racial polarization to meet someone who is מודה על האמת. "Romney sounds sincere and like a true friend of Israel ..."
I have lived in Israel almost all of my life. During that time, I have followed the progress of many American presidential election campaigns. That said, I have reluctantly come to the conclusion that every single presidential candidate "sounds sincere and like a true friends of Israel". Words are cheap, and statements such as the one I have mentioned do not form a binding contract, neither with the American electorate nor with the government and people of Israel. Put more simply and more cynically, candidates for elective office - any elective office - will "promise" heaven and earth just to attain whatever coveted job they want ; it's human nature. Jewish American electors should vote for a new President of the United States of America and how that person will govern the United States - not for one facet of his supposed foreign policy alone.